Here at TheNonExec we handle 2 – 4 transactions per year, so whilst we have a reasonable view on the market, it is useful to have a broader view in terms of M&A trends. For the past 24 months, we have generally seen a bull market for sellers commanding considerable interest in the M&A market. So what does the broader outlook suggest? Allen & Overy’s annual study of the private M&A market showed growing levels of auction activity in 2018. 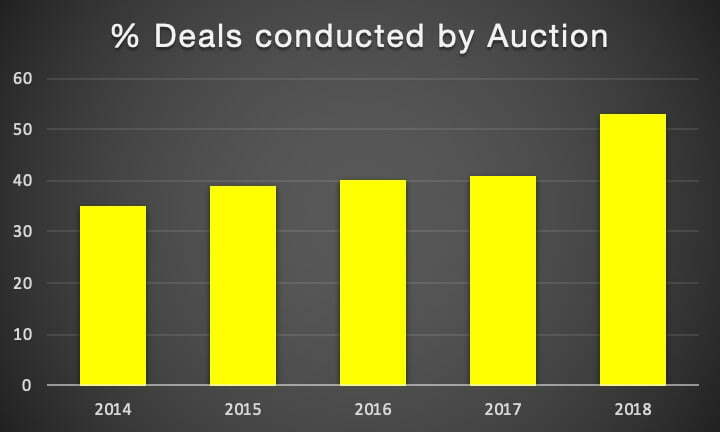 This in-depth analysis of more than 1,000 of their deals over the last seven years shows that there is a growing trend for private M&A deals (at least those they advised on) to be conducted as auctions. Results for 2018 were up significantly, 12% to 53% on the previous year. Private Equity funds continued to win a high proportion of these auctions, up to 46% of deals in the sample. Confident sellers were reported to be seen to having the upper hand on terms of the deal. This was substantiated by a decline in use of mechanisms such as material adverse change provisions, pre-closing termination rights for material breach of warranty, and warranty repetition (giving a buyer the right to claim damages if a warranty is incorrect at closing). All methods designed to delay the passing of risk to buyers ahead of closing. Sellers will only consider an auction if they believe they can attract significant competition. So increased action activity is a strong indicator of current market confidence. Digitalisation also continues to be a strategic catalyst for deal-making. Traditional companies have transformed their operations for the digital age by looking to build, buy and/or collaborate with start-ups. There has been a tougher approach of regulators, particularly heightened pressure from antitrust authorities. Also in recent years there has been an explosion in requirement for warranty and indemnity (W&I) insurance for PE exits. The biggest change Allen & Overy has seen is towards “stapled W&I”, with sellers going to market with a 100% insurable sale and purchase agreements, underwritten on the basis of vendor due diligence and on condition that specified checks are carried out on the buy-side.